New York, NY | May 25, 2017 Madison Square Park Conservancy (MSPC) and United War Veterans Council (UWVC) today commemorated the restoration of the illuminated star atop the Eternal Light Flagstaff in Madison Square Park with a flag-raising ceremony at the monument, and also announced plans for a renovation of the surrounding Park landscape, made possible by a generous grant from New York Life Insurance Company. Joining MSPC Board Chair Sheila K. Davidson, Executive Vice President, Chief Legal Officer & General Counsel at New York Life Insurance Company, speakers at the ceremony included Manhattan Borough President Gale A. Brewer, NYC Parks Manhattan Borough Commissioner William T. Castro, UWVC President Dan McSweeney, Commissioner of the United States World War One Centennial Commission Libby O’Connell and MSPC’s Board Chair Emeritus David Berliner, President of the Brooklyn Museum. The star will be officially relit following a brief ceremony at 8:30pm tonight. In his new role, D’Auria is responsible for overseeing the direction and completion of Zwicker Electric’s new construction projects. The firm, which has built its reputation as one of New York’s most reliable and capable electrical contractors, specializes in a range of markets and project-types, including commercial, residential, healthcare, retail and hospitality. On March 3, 2014 Zwicker Electric and City Parks Foundation welcomed guests to the 10th Anniversary Seniors Fitness Benefit, a fundraising cocktail reception that supports CityParks Seniors Fitness. Guests enjoyed hors d’oeuvres and drinks at B.B. King Blues Club & Grill in Times Square. Zwicker President, David Pinter and renowned guitarist, Woody Mann, protégé of the legendary Reverend Gary Davis, played music along with other special guests. The annual Seniors Fitness Benefit raises the funds necessary for City Parks Foundation to offer free tennis, yoga, and walking for seniors in several parks throughout the spring and fall. CityParks Seniors Fitness offers free activities and social experiences that enhance the lives of older New Yorkers and makes our parks more inviting. On December 5, 2013, Zwicker Electric’s friends and families gathered for the company’s Annual Holiday Gathering at Hill Country Barbeque in midtown. During the event, Zwicker celebrated its employee anniversaries, accomplishments and upcoming opportunities with good food and live music. On Tuesday, March 19, 2013, Zwicker Electric and City Parks Foundation welcomed guests to the Seniors Fitness Benefit, a fundraising cocktail reception that supports CityParks Seniors Fitness. Guests enjoyed hors d'oeuvres and drinks at B.B. King Blues Club & Grill in Times Square, as well as a special performance by Zwicker's President, David Pinter and renowned guitarist, Woody Mann, protégé of the legendary Reverend Gary Davis. The expansion of the BTEA's core leadership group signifies the unprecedented support that the organization has earned among the construction contractor community. Zwicker Electric recently volunteered its expertise, time and resources to help Habitat for Humanity of Westchester rebuild a 'Zero Energy' home for a low income family in Yonkers, New York. 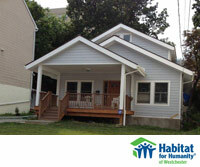 The work is part of Habitat for Humanity of Westchester's effort to improve housing and decrease homelessness throughout Westchester County, and to make affordable shelter for all New Yorkers. Thanks to Zwicker, Habitat for humanity is one step closer to its goal and the two organizations continue to work together to help rebuild the community and create better living for families in New York. Zwicker Electric, one of the New York’s leading electrical contractors announced its strategic alliance with ExteNet Systems, Inc., a Chicago-based company that designs, builds, owns, monitors and maintains indoor and outdoor distributed telecommunications networks for use by multiple wireless carriers, announced David Pinter, President and CEO of the 65-year-old New York City headquartered firm and Ross Manire, ExteNet’s CEO. “ExteNet Systems is a distributed antenna system (DAS) that is installed in an existing or new construction building through its HVAC duct network, “ explained Pinter. “It is a very natural extension of the building’s existing infrastructure and, as a result, is an efficient installation for many of our clients.” ExteNet Systems provides an exclusively patented iDuct technology with multiple OEM configurations. The DAS network is a more reliable, cost-effective solution than alternative systems since it builds on the existing structure’s duct system, ensuring gap-free and environmentally efficient coverage. 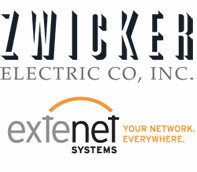 Zwicker will be providing all installation services for ExteNet in the New York market. Experts project over 50 billion connected wireless devices will be operating by 2020. Commercial facilities, including office buildings, hotels and large, high traffic installations such as universities, transit hubs, healthcare, entertainment and stadium facilities, will require state-of-the-art wireless services to support the data access as well as security and emergency response needs. ExteNet Systems is installed at little expense to the owner and provides multiple carrier services to a building. About Zwicker Electric Co. Inc.
Zwicker Electric Co., Inc. (Zwicker) is one of the region’s leading electrical contractors serving the commercial new construction and the interiors markets. Established over 65 years ago, the firm has built many of New York’s signature commercial, residential, institutional and retail spaces throughout the tri-state area. 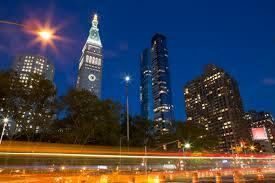 It is widely recognized for its innovative engineering expertise and its application to new construction installations including 7 World Trade Center, AOL Time Warner, 3 Times Square, Metrotech Center, One Bryant Park, among many others. A member of Local 3 IBEW, Zwicker’s President, David Pinter has served as President and Governor of NECA New York, the largest chapter of the National Electrical Contractors Association. 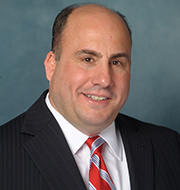 Recently, Mr. Pinter was elected Vice President of NECA’s District 1 which includes chapters in Connecticut, Maine, Massachusetts, New Hampshire, New Jersey, New York, Rhode Island and Vermont. ExteNet Systems, Inc. designs, builds, owns, monitors and maintains distributed telecommunications networks for use by wireless carriers. ExteNet’s networks feature distributed antenna systems (DAS) that enhance coverage and capacity for superior wireless services in both outdoor and indoor spaces. ExteNet provides indoor distributed network solutions designed to improve wireless services in a number of specific environments including commercial real estate, government agencies, healthcare, higher education, hospitality and sports and entertainment. ExteNet ranked 5th on the Wall Street Journal’s “Next Big Thing” list of the top 50 venture-backed companies in 2011. The company’s executive offices are located in suburban Chicago’s I-88 high-tech corridor. For more information, visit www.extenetsystems.com, email networks@extenetsystems.com or call 630-505-3800. The National Electrical Contractors Association (NECA) announced its new District 1 Vice President, David B. Pinter, President of Zwicker Electric Co., one of the premier electrical contractors in New York City, and the firm he has been with for over 40 years. In the past, Pinter has served as a President and Governor of the New York City Chapter of NECA, which is the largest chapter of NECA in the country. 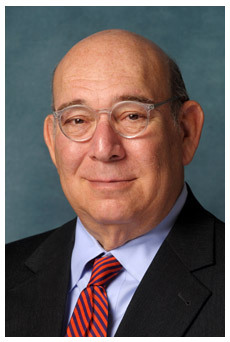 Pinter also served as Chair of NECA New York's Education Committee. NECA's District 1 includes the chapters in Connecticut, Maine, Massachusetts, New Hampshire, New Jersey, New York, Rhode Island and Vermont. In his position as District 1 Vice President, Pinter is responsible for participating in select meetings throughout the year. Additionally, each chapter will look to Pinter as a source of leadership and guidance. New York City's construction trade unions and their management counterparts recently negotiated a new PLA agreement between the Building and Construction Trades Council of Greater New York (BCTC) and the Building Trades Employers' Association (BTEA). NECA played a central role in this negotiation, specifically through NECA member, Zwicker Electric. 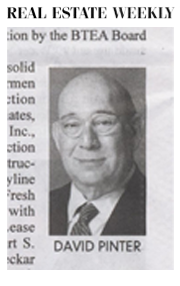 David B. Pinter, President of Zwicker Electric and board member of the BTEA and New York Building Congress, held a particularly crucial role in negotiating the terms of the PLA with all New York City union building trades on behalf of management. To read the whole article please follow this link.